(DURHAM, N.C.) —The 150th anniversary of the incorporation of the City of Durham will be commemorated on Saturday, April 13 at the American Tobacco Campus from 10 a.m.-2 p.m. The official sesquicentennial birthday party will be celebrated with four hours of entertaining, educational, thought-provoking and tasty activities for all ages. The event is free and open to the public. The event will kick off with entertainment at 10 a.m. Mayor Schewel will lead the official birthday recognition, with fanfare to follow. Durham 150’s convening committee has established four pillars, or themes, at the foundation of Durham’s story to be recognized throughout 2019: history and education, innovation and entrepreneurship, social equity and robust democracy, and arts and leisure. Those four pillars will be on display at the opening celebration, with areas of American Tobacco Campus, referred to as neighborhoods, filled with exhibits, local experts, artists and activities to explore that are designed to inspire and entertain. 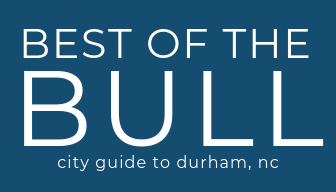 Those who visit all four themed neighborhoods may enter a drawing for prizes that will include entertainment and staycation packages from Durham businesses. In addition to the theme neighborhoods, there will be live entertainment on the main stage throughout the celebration. Some of the confirmed acts include The African American Dance Ensemble, the Bouncing Bulldogs, Kidznotes, and storyteller Willa Brigam. There will also be a Durham 150 photo mosaic mural, a 9’x6’ work of art that will commemorate the year’s activities with photos of community members and those present at the Opening Celebration. A story kiosk will be on-site for attendees to share their own story on video and become part of Durham’s historical archives. To close the Opening Celebration, there will be a “Running of the Bulls” at 1:30 p.m. Up to 2,000 interested attendees will receive a floatable rubber bull to race down the American Tobacco Campus river. The top three winning bull owners will win prize packages, and all race participants can take a bull home as a souvenir. For more information about Durham 150, The Durham 150 Opening Celebration Presented by Aetna and other events, visit www.Durham150.org. Previous articleWelcome to Durham, NC- Happy 150th Birthday!